In an effort to match each of our dogs with their best possible home, Animals’ Crusaders has developed a multi-step adoption process. We put a lot of time, effort, and love into rehabilitating our dogs and feel it is important to carefully screen potential adopters. We require that an application be filled out prior to placing any of our dogs into new homes. The questions on the application are designed to allow us to get a sense of your family, what you expect from a pet, and information about your current and past pets to identify dogs that will or will not fit comfortably into your home. We will schedule a home visit with you prior to adoption. We’re not at all concerned with your housekeeping or decoration skills, we pay particular attention to your yard and fence to make sure they are dog safe, escape proof, and have adequate shelter. We have a adoptions the first Saturday of every month at Petco Oro Valley marketplace 11:00 am – 3:00 pm where you can meet many of our dogs. 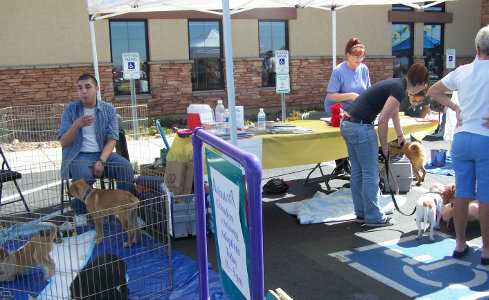 If you can’t make it on a Saturday we can also set up a time that is convenient for you to come out and meet our dogs. Once our screening process is complete and you have picked a dog it’s time to take your new family member home. We will spend some time with you discussing the best way to integrate your new pet into your home to help avoid some of the pit falls that go with adopting a new dog. From our experience adopting dogs and doing foster care we can usually anticipate any potential problems the help you correct them as soon as possible. Over the next month or two we will check in with you several times to see how things are going and if you have any questions or concerns. We have quite a lot of experience dealing with behavior and health issues and you can call us anytime with questions or concerns about your new dog. While we do everything we can to help make an adoption successful we realize that sometimes things just don’t work out. If it turns out that for any reason you won’t be able to keep your dog we will gladly accept them back into our adoption program.